If you’re an individual, small business or group, GnuCash is an excellent way to balance the books for free. It’s no coincidence that tax also means 'a strain or heavy demand' – keeping the numbers right for self assessment, charity reporting or business tax can be a real strain, especially if like us you’re rubbish with financial things. But if you’ve got the right tools they can do all the work for you. All you need to do is enter the right information. GnuCash is that tool. 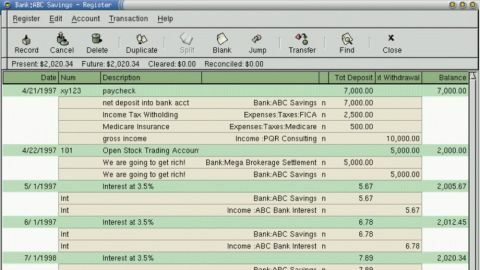 It’s a fully featured double-entry book keeping app that can handle personal and business finances, although if you think you’re going to be a Fortune 500 company you’ll probably need something a bit more ambitious fairly quickly, but for groups, smaller charities, small businesses and personal finances it’s more than up to the job. GnuCash is cross platform too, so if you’re running Windows today and end up switching to Linux or Mac in the future (or vice versa) you can take your data with you. It isn’t remotely pretty or exciting, but GnuCash is straightforward and easy to navigate and the online documentation is exhaustive. There are tons of how-to videos on YouTube too. It’s just a shame that the GnuCash companion Android app doesn’t automatically sync with the desktop version; you have to migrate the data manually. Double-entry book-keeping isn’t famous for its beauty, and in keeping with that GnuCash is about as dull as a press release from the taxman. But that’s okay, because excitement in accounting usually means the finance guy embezzling all your profits and escaping with them to start a new life in Mexico. If you know your way around accounts software, GnuCash is simple and straightforward. It won’t make your soul sing but it will balance your books. The only real niggle is that it’s not quite as customizable as some paid-for rivals, especially when it comes to invoice design. The latest version of GnuCash lets you export any report directly in PDF format, attach files to transactions, and assign colors to different accounts. For more details, see the official release notes.